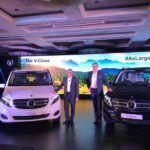 Mercedes-Benz has launched its Premium MPV the V-Class in India today with prices starting at Rs. 68.40 Lakh for the Expression variant and Rs. 81.90 Lakh for the Exclusive variant Ex Showroom India. This is the first launch or the German car maker in India for 2019. The V-Class is produced at the Mercedes-Benz Vitoria plant in Spain. On the outside the Mercedes V-Class looks like a typical MPV but with a premium touch. The V-Class comes with bold character lines on the body. Th front looks like the Mercedes sedans and very similar to the E-Class or the S-Class with LED lights and integrated DRLs. The front grill is also typical Mercedes style with the prominent Star logo in the middle. Other key styling features include trendy alloys, electric sliding doors, roof rails, large openable rear windshield. On the inside the V-Class oozes premium space and features with leather captain seats, clean finish dashboard, large AC vents, COMMAND infotainment system etc. The V-Class is offered in two seating configurations- an eight-seater variant where both second and third row get three executive seats and a seven-seat version where the second row gets two executive seats. The second-row seats can also be rotated towards the door which adds to the comfort as it makes ingress and egress easy. Moreover, the seats can also be rotated to 180-degrees and the passengers can sit facing each other. The Mercedes V-Class is available in two wheelbase – Long Wheelbase Exclusive variant with 5140mm and Extra long wheelbase Expression variant with 5370mm. The Mercedes V-Class is one of the most premium MPV for India and comes with a host of premium features and equipment level loaded to it. The V-Class is available in 6-seater and 7-seater options with the 6-seater version driving on 17 inch alloys, features on this version include the table package, rear window opening with parcel shelf and shopping crates, seats in Nappa leather, Agility control suspension with selective damping, Ambient lighting, 360 degree camera with park assist, electric sliding doors, High performance intelligent headlights. The 7-seater version of the Mercedes V-Class drives on 16 inch alloys and comes with Comfort suspension, has a longer wheelbase of 230mm with a larger boot area, Attention assist, Dynamic intelligent LED headlights. Both the versions come with 2-zone thermotronic climate control, touchpad and hand writing recognition. Powering the Mercedes V-Class is the BS-4 ready OM654 2.2L 154bhp Diesel engine with 380Nm of torque which can do a zero to 100kmph in 10.9 seconds. On the safety front the Mercedes V-Class is loaded with 6-airbags, attention assist, active parking assist with 360 degree camera and Pre Safe features. The Mercedes V-Class is available in 4 paint shades- Obsidian Black Metallic, Cavensite Blue Metallic, Mountain Crystal White Metallic, Brilliant Silver Metallic.